Hands Across the Water refers to the Congolese children we support as our "starfish". Please meet one of our favorite starfish, Fredrika. Fredrika (name changed) is an orphan who has consistently demonstrated her incredible ability to rise above her circumstances. When we met her in 2010, she had no one in her world who could afford the $10 monthly fee for high school and was being forced to terminate her education. It would cost $20 per month to attend a school appropriate to a student with her drive and ability. Fredrika spoke and wrote some English, a rare skill in a Congolese child. With her mother dead and her father a hopeless alcoholic, at the tender age of 11, she was already functioning as caregiver to two younger siblings. She would get them dressed and off to school before leaving with them to walk two miles to school. With a dream of attending high school, she was attempting to earn the tuition for school by working the fields of a local farmer, but quickly learned there were not enough hours in a day. We made a difference to Fredrika by covering all of the educational expenses for her five years of high school. We are so proud of Fredrika as she has now graduated from Pembas Academy in Congo and speaks and writes five languages. Trained in business and computer technology, she has found employment and helps support her siblings who remain under her care. Hands Across the Water began our high school scholarship program for orphaned students in the rural village of Kaboke. These were bright and capable students who had no chance of progressing beyond elementary school without our help. Sadly we could only accept 5 students into our program promising that we would pay all of their educational expenses through graduation. The ranks grew as year after year determined young people broke our hearts with their stories of personal loss and pleas for our assistance. Over the years we have covered all educational fees for a total of 26 students and assisted an additional 6 with exam fees and graduation costs. In September of 2018 we learned that the last 10 of our students completed their requirements for graduation and passed the arduous state exams. 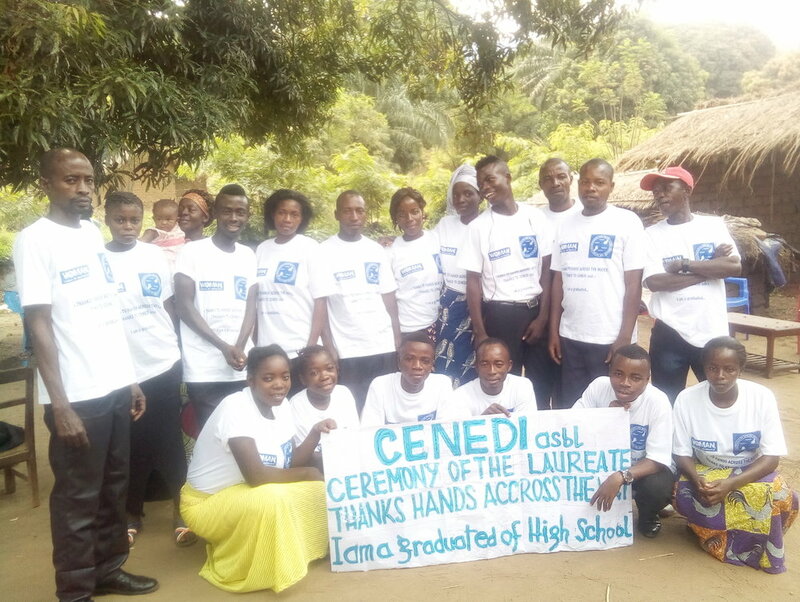 In October CENEDI organized a celebration in Kaboke for all of our graduates from 2014-2018. Proud relatives provided tearful speeches expressing their gratitude for the support provided by HAW. This spring, our grads will begin a tutorial program for the students attending Kaboke Elementary School. In 2013, the nation of Rwanda decided to flush out militia groups from the city of Goma by launching bombs across the river into the Congolese city of Goma. Hundreds of innocent Congolese were killed, expanding the ranks of Goma’s orphans. The elementary school in Goma was severely damaged and did not reopen. War is routine in this region, and survivors have returned to the city to bury the dead and rebuild their lives. Hands Across the Water, in partnership with CENEDI, opened the Community Charity School (named for Community Middle School) on September 7, 2015. The school is operating with well over half of the population on “scholarship status”, and we are committed to raising the funds for this wonderful venture to be successful and for these children to know that they are supported. It takes dedication to teach our starfish. Our instructional staff provides a safe nurturing environment in the midst of violence and chaos. The teachers have been willing to work without compensation when funds were not available, and have taken voluntary pay cuts to allow us to keep the doors open. They have persevered with armed militia groups roaming the area and malaria ravaging the student population, serving students who often show up to school in rags and feeding them when they have not eaten for days. We honor every one of these wonderful resilient educators and thank them for being the heart of C.C.S. In a country where education is considered a luxury, CCS students attend regardless of means to pay. The dedicated teachers struggle with very few supplies but with a solid belief that education can positively affect the lives of these children. CENEDI has no external financial support other than that which comes from generous contributions through Hands Across the Water.